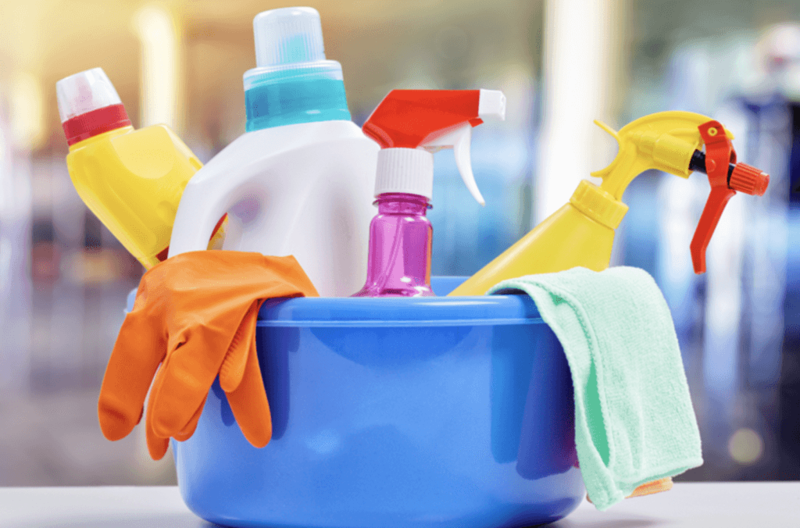 The Top 5 Cleaning Products You Should Not Live Without! In a world of endless choices sometimes it can be daunting and expensive to create an arsenal of tried and true go-to cleaning products. If it’s your job to clean vacation rentals it’s especially important to find the best products possible without breaking the bank for yourself or your hosts. Make it easier on yourself by using products that can multi-task and your cleaning bucket will be lighter too! Here is a list of my favorite cleaning products that I cannot live without! Trust me this is not time consuming! Just use equal parts white vinegar with distilled water (this will leave less buildup) and put it in a spray bottle. You can make the solution stronger or weaker as you prefer but I like to add at least half vinegar to make it more effective. If you add a few drops of essential oil it will make your concoction smell less like you’re eating fish and chips at a British pub, but even if you don’t, rest assured the smell dissipates quite quickly! Not only is this a “green” cleaner (it’s better for your health and the environment) it is also super cheap to make. It is by far the most effective glass cleaner I have ever tried. It also works wonders on hard water stains and mold. I even spray a light mist on tables etc. and wipe with a cloth for dusting purposes. You can also add it to laundry as a softener and to get rid of odor. I seriously cannot rave enough about how much I love the cleaning power of vinegar! Magic is in the name for a reason. They are magical! Use these on scuff marks, white cast iron sinks, bathtubs and more. The results will amaze you. I use them on showers that have textured basins for non slip purposes. They literally cannot get clean using anything else. The convenience will save you time and the solution not only cleans but leaves your rental smelling fresh. Do yourself a favor and stop wasting your time spreading around muddy messy water with a mop. You can buy refills cheaper at a warehouse club store or look for local sales and stock up. If you need to be more budget conscious there are also similar products where you can make your own solution to put in the reservoir and use washable microfiber pads. Any brand works well and you can also buy these at a warehouse store cheaper or for even less if you buy their store brand. These work great for toilets, bathroom sinks, sealed counters, remotes, light switches and anywhere else you want to clean and simultaneously disinfect. They are easy, smell good and eliminate a lot of the “ick” factor when cleaning some messes. Ok so technically these aren’t a “cleaning” product but they help make your rental smell clean and happy so it counts! These are similar to air wick or glade plug ins which are also great but I love these the most. Bath and body works wallflowers have a huge variety of scents (and the best seasonal scents you will ever find) and the plugs they screw into come in a variety of styles if you want something less plain. They are so cute they actually look like part of your decor. Many are also night lights which I think is super convenient especially in areas like bathrooms. They are pricier than other brands but you can always find them on sale and they actually last longer. I have put them side by side until they run out so I know this to be true! So that’s my list of must have products for vacation rental cleaning as well as my own home! An honorable mention also goes to pledge wood cleaner because it cleans way more than just wood (even stainless steel and leather) I just don’t tend to need it as much as my other products.